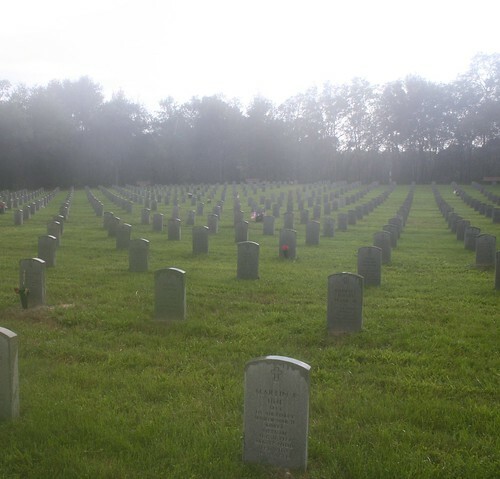 National Cemetery-Bushnell,Florida, a photo by jayfherron on Flickr. This is Memorial Day Weekend. l still become emotional about the day and the reminder. lt is not a day of happiness and l cannot find a way to see fit to throw a bar-be-que,it just does not work! ln the fore front of this photo taken at the Bushnell Florida National Cemetery is the grave of Martin Edward Uhl (my former father in law). He is one of thousands of reasons we should all want to reflect on the real meaning of this date! To pay respects to those who lost their lives in service to our country! Martin Uhl may not not have lost his life for our country-but he gave it none the less! He served in World War Two. Bombed down over Germany somewhere and ended up a prisoner of war. But, that did not keep him from fighting in Korea, or in Viet Nam. lt is not just him! There are so many story’s of men in battle, and of those who gave the ultimate sacrifice, the many who had suffered and the many that still do…this is what Memorial Day is supposed to be given to, to pay respect and give thanks to those who gave thier lives! l dont know if these few words will show up on my blog. My accounts on-line have been altered by someone unknown-and l can no longer sign into my wordpress…only being able to write this via ‘flickr’, and…since l hav’nt paid the bill there (who knows)…but, each year when this date comes around l become more aware of my own service, and l had to say something about the service of others! l hope to encourage you to go a cemetery and find the grave of a soldier or a sailor or a marine, and say a prayer of thanks.